I walked into the lab one day and recognized a visitor sitting at a table talking to a small group of students and postdocs. He wore a tattered sweater and and a dark felt cap. As he noticed me, he stood up to introduce himself. "I'm Linus Pauling," he said softly as he extended his hand to shake mine. I was struck both by the awareness that I was unexpectedly shaking hands with a two-time Nobel laureate and the kind, modest manner this icon of the science world was presenting himself to a lowly graduate student. "I know," I replied before introducing myself. He smiled. We chatted for a while and later that day, Dr. Pauling gave a lecture to a packed Wheeler Auditorium at UC Berkeley. The conversation wasn't remarkable in any way - we didn't resolve any of the big molecular biology issues of the day. 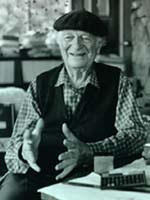 In fact, I can't remember anything about what was discussed -- only that we discussed whatever it was with Linus Pauling. If I hadn't recognized him, I may have not stopped to greet him. I wonder how many extraordinary people I've passed by - those with Nobel Prizes and those without any accolades at all. I wonder about the basis of an extraordinary person and I wonder where such judgments originate. The kōan that instructs the Zen student to kill the Buddha is interpreted generally to suggest that we kill our illusion -- of the Buddha or anyone else we meet along our road, our path to enlightenment. We can not know anything when what we see is only a projection of our perceptions, perspectives and expectations - our illusion. That's all Linus Pauling was to the Berkeley grad student from Snohomish, WA. To be fair, that's probably all he expected to be to many people who recognized him. He was playing his role in the illusion of others. He may have even crafted parts of his public image at some points in his life and he probably used the image to his advantage at times. Yet, had I seen past all that, I might have not missed an opportunity to learn something -- I might not have settled for a story. At that moment, he was my Buddha in illusion. Illusions are responsible for the dualistic nature of our existence. They are the domain of the small self -- the ego. They separate us from Truth, from our True Nature, and from the God within us. They also leave us vulnerable to the manipulation of the Magicians. Live your own reality -- don't allow another's reality to become yours by proxy. Look beyond the values of others and don't overlook the values among the least valued. Don't be trapped by dogma -- living by other peoples' illusions. Don't let opinions of others drown out your inner voice. Pierce the veils of illusion to know yourself. Free yourself to be yourself. Be yourself to be free. The fact is, I did learn something extraordinary that day. It had nothing to do with the quantum mechanics of the chemical bond, protein folding dynamics, or anything of the sort. I learned that a great person - a Buddha - is never too important, too famous or too powerful to embody the modesty and humbleness of our human condition. Thank you, Linus. An alternative, and possibly superior, resolution of the "Kill the Buddha" koan is that the Buddha is an archetype and therefore found within rather than outside of oneself. Even, the current Dali Lama has referred to the Buddha as an archetype. Therefore, if one meets the Buddha on the road, he is an illusion and must be recognized as such.